For the fourth consecutive year, the AUS delegation secured the Outstanding Delegation Award, the highest-ranking recognition, at the National Model United Nations 2019 (NMUN 2019) in New York City, United States, held March 23–29, 2019. In addition, the AUS delegation received two Outstanding Position Paper awards in two distinct committees and four students were selected during the conference as chairs and rapporteurs. The university’s delegation represented Romania in four committees; UN Peacebuilding Commission (PBC), United Nations Environment Assembly (UNEA), United Nations High Commissioner for Refugees (UNHCR), and World Health Organization (WHO). The delegation consisted Emad Toubar, Fatima Almheiri, Maryam Alqasemi, Nada Nassereddin, Rahaf Sheiko, Rasha Darra, Vishnu Narayanan and Yuvika Bhati. “Participating in the NMUN has been one of the most memorable and inspiring experiences of my life. Watching our delegation, a group of students from different backgrounds and majors, grow together as a family has genuinely been heartwarming. Over just a few months, we worked together, learned from each other, and inspired one another to become better delegates and better people. 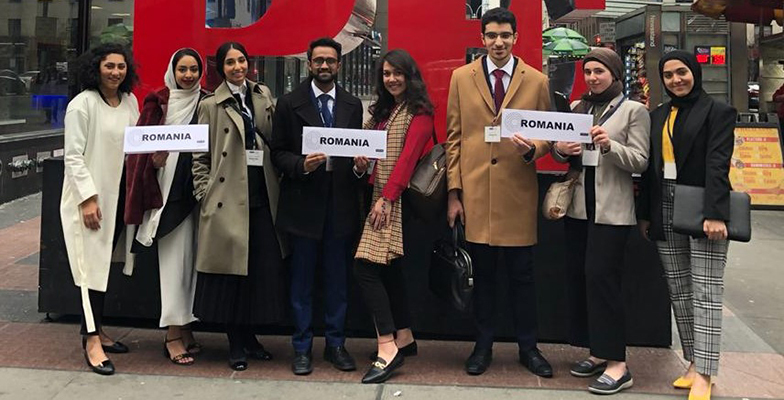 I am honored to have been a part of this successful journey and I look forward to seeing how the next group of delegates continue to push the boundaries of what makes NMUN so great,” said Emad Toubar, a sophomore majoring in computer engineering. “It was a great pleasure to represent American University of Sharjah as the delegation of Romania at the 2019 National Model United Nations. The conference provided us with the opportunity to work with delegates from all around the world in order to tackle relevant and contemporary topics that matter worldwide. Being selected as a Rapporteur for the Human Rights Council enhanced my communication skills, my writing skills, and my interest in politics and diplomacy and it provided me with an overview of the work of the United Nations. We also had the chance to visit the UN General Assembly and support our hardworking teammate who presented her speech at the UN podium,” said Nada Nassereddin, and international relations senior. Students interested in exploring opportunities for leadership development should join the Student Leadership Program.